Universitas Indonesia (UI) won several awards at the Model United Nations (MUN) Conference at Nanyang University of Technology. This activity was held in Singapore, on 15-17 February 2019. In the event, UI won several titles, namely the title of The Most Outstanding Delegates for Chico Athalla (Faculty of Social and Political Sciences, 2018) and Rayhan Mahindra Wardhana (Faculty of Social and Political Sciences, 2018) in the UN Security Council delegation committee, Honorable Mentions awarded to Marvela Ester (Faculty of Economics and Business, 2017) on the FAO committee, and the title of Best Position Paper for Rania Rifdah Taufiq (Faculty of Medicine 2018) on the WHO committee. The title of The Most Outstanding Delegates is a proud achievement because it is equivalent to the second overall champion. While the title of Honorable Mentions is an honorary title for the third position of the number of committee participants. The United Nations model, otherwise known as “MUN”, is an academic simulation of the UN session where each participant who participates in this activity is introduced to the procedures of the UN session procedure. Participants who participated, were assigned to play a role as delegates representing the attitudes and beliefs of a country regarding global issues discussed in a particular committee. This activity basically emphasizes the importance of diplomacy as a solution to global problems. Another goal is as a medium for developing public speaking skills, debating, writing, researching, and negotiating for students. The event was also attended by delegates from world-renowned universities, including delegates from Hwa Chong Institution, Raffles Institution, Nanyang Technological University, and National University of Singapore. 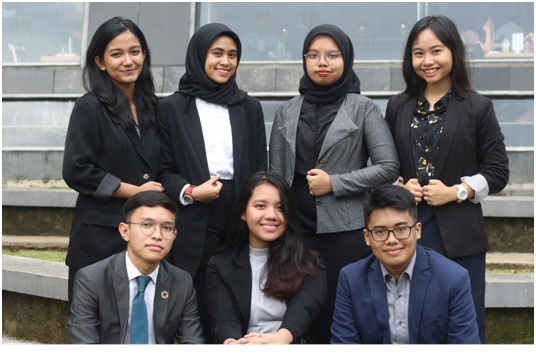 In addition to these 4 students, Universitas Indonesia also sent other students in this MUN event, namely Rahmadia Kushardiani (Faculty of Economics and Business, 2017) who participated in the DISEC committee, Adila Nurul Ilma (Faculty of Law, 2018) who participated in the SPECPOL committee, and Illona Christine (Faculty of Law, 2017) who participated in the ICJ committee.